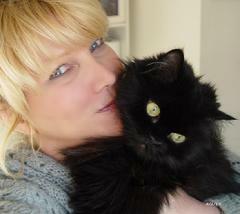 Welcome to Meowzalot.Com, the website of Kelly Powers Fitzpatrick. I live in Virginia with my husband and a little crew of furry kids. I was painting for many years, but now when I'm not playing with our pets, scooping litterboxes or cleaning up hairballs, I'm playing with dolls ~ I am now making needle felted animal dolls and customizing Blythe dolls.